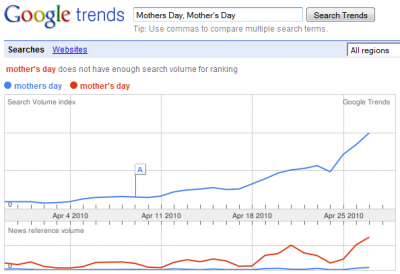 Mother's Day Search & Marketing on the Rise, Too Late for SEO, PPC & SMO? When marketing online you should take into consideration your sales cycle for the purpose of starting and stopping your advertising. If you ship items and need to have orders placed by the Friday before Mother’s Day, you may need to cut off your ads on that Friday. If you deliver Flowers right up to and on Sunday the 9th, you might find it acceptable to run your ads into Mother’s Day. Are you going to be available on the Weekend to stop ads when your cycle is over? If not, then you will have to consider whether to shut them off on Friday or to leave them running until Monday. Starting on SEO now, for the purpose of gaining organic search traffic, with less than 2 weeks until Mother’s Day, will make it difficult to see great results. Optimizing a site’s homepage will probably make the most impact in the remaining time. However, on-page optimization to any page can be helpful and can consist of as little as adding a some new content to completely changing the page up. Add some new Mother’s Day themes content such as a “Suggest Product List” or “Gifts for Mom”. Add Keywords to and Optimize the Title Tag. Optimize the Meta Description tag. Build a few Followed Links to optimized pages. Add Links to your Social Media sites to attract the attention of the search engines. Create a couple of new themed pages. Since there are so few days left, you will see better search engine returns if your site is more “link” popular and/or gets indexed rather quickly. I would suggest updating and submitting you XML Sitemap to the engines as soon as your changes go live. PPC campaigns for Mother’s Day could be your best advertising opportunity to capture search traffic. You can launch ads as quickly as 30 minutes (if you know what you are doing) and be generating keyword triggered visitors soon after. Due to limited time remaining, traffic volumes and reach, your best pay per click ad platforms are going to be Google AdWords, Yahoo Search Marketing and Microsoft adCenter for Bing.com. Since you will probably be starting a new campaign with new keywords and ads, you will see a slow ramp up in exposure until the engines, Google in particular, “get to know” your ads. This should also give you a little time to test and measure before blowing through your entire PPC budget in the first day. Start with Google AdWords – They have the largest search share for you to tap into. Consider Geo-Targeting your campaign if you have a clear local audience. Start by focusing on what your main products and services. They will convert at a higher rate. Consider targeting some general keywords like “Mother’s Day Gifts”, “Gift Ideas”, “Flower Delivery” “Fine Jewelry” and the like. Conversion rates on these will be lower than other keywords, but may still be worth it due to a higher conversion rate cycle we are in. Create themed landing pages. Since you are targeting Mother’s Day shoppers make their experience simple and easy. Don’t forget the Negative Keywords! No sense in paying for traffic for “Purple Tulips” if you only sell flower arrangements with Red and Yellow ones”. If you are already active on various Social Media websites then you are probably in a good position to take advantage of social for your Mother’s Day promotions. Since your followers and friends are already familiar with you, they will be more open to seeing what you have to offer. If you do not currently have a firm social following then you may want to consider advertising on social sites like Facebook and LikedIn. The demographics and targeting that are provided will allow you to better define your advertising and quickly tap into your audience. Create a Mother’s Day promotion and then Tweet and Post about it to your friends and followers. Watch social trends related to Mothers Day and make it a point of tweeting, retweeting and posting related information. You will be gaining exposure to others who are paying attention to these trends as well. The search engines are gathering hints and clues about what is popular online from Social Media sites. Tweets and posts are a good way to generate some additional search buzz and can impact organic results. 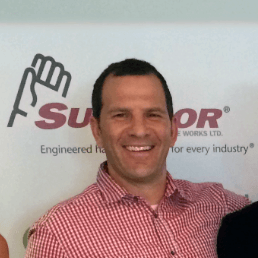 Consider your sales cycle. If there is only 3 days left for your customers to place an order for delivery by Mother’s Day, make them aware of it. Something like this may work well for you: “Send Your Mom The Flowers She Deserves! Only 3 Days left to place your order.” Little promotions like this are less than 100 characters, and leave plenty of space to include a link. Don’t over due it. Tweeting and Posting too often, or repetitively sending the same promotion, will annoy your audience and is a sure fire way to lose followers quickly. Any ideas that you care to share with someone who is sometimes uncreative, yet always has the best intentions? Do you have any additional Mother’s Day Search Marketing and Internet Promotion Tips that you would like to share? Feel free to share your thoughts. Comments Off on Mother’s Day Search & Marketing on the Rise, Too Late for SEO, PPC & SMO?